Salads have come a long way since the days of iceberg lettuce with tomatoes and carrots sprinkled on top. Today’s salad combines a unique blend of tastes and textures along with ingredients to support your brain and body. I’m teaming up this year with B&W Quality Growers to share nutrition information and recipes on watercress. As a dietitian I grew up with limited exposure to a wide variety of foods and a love for potato chips and baking anything sweet (from fudge to cinnamon swirl bread from scratch). My interest in nutrition led me to read many books on nutrition and athletic performance as well as overall health. When I opened my mind to trying a wide array of foods and learning about quality ingredients I realized healthy eating could give me the energy I needed and help me feel really good. This was an ah-ha moment: I didn’t have to compromise good taste to fuel my body well. With a healthy dose of skepticism I tried different dark green leafy vegetables. Watercress quickly became one of my favorites. It has a sweet yet slightly bitter taste and works well with a wide array of vegetables and fruits. Plus, it packs a serious nutrition punch. Watercress is a good source of vitamins A and C. Vitamin A is essential for normal vision, skin health and maintaining immune functioning. Vitamin C is another powerhouse. It protects the body from harm due to free radicals. Free radicals are essential for health but they can run around and cause damage too. Vitamin C also supports blood vessel functioning, wound healing, iron absorption and nerve functioning. Watercress is also an excellent source of vitamin K. Vitamin K forms and strengthens bones and limits nerve damage in the brain. As a green leafy vegetable it also protects against cognitive decline. A study published in the journal neurology found higher intake of green leafy vegetables, 1.3 servings each day, helped slow brain decline associated with aging compared to those who ate little green leafy vegetables getting only about 0.1 servings, on average, per day. Leafy greens, like watercress, are part of the MIND diet, a diet that is associated with a 53% lower risk in cognitive decline! One of my new favorites combines the tantalizing tastes of watercress, pear, fig and goat cheese with balsamic vinegar and extra virgin olive oil. Ingredients matter. I choose soft dried Turkish figs since they are tender and moist. I opted for good aged balsamic vinegar, from Modena, Italy (with an IGP stamp). Balsamic vinegar has a strong sweet taste that intensifies the flavor foods you drizzle it over. Olive oil comes in a wide variety of flavors and quality. I used one from Masseria Brancati in Ostuni, Italy. In a region known for olive farming, this is arguably the oldest olive farm in the world with trees dating back over 3,000 years. Though I recommend going to this region at some point, you don’t have to travel to Italy to get a good quality olive oil. Your local grocery store should have a few good options for you to choose from. Click here for a guide to oils, including olive oil. 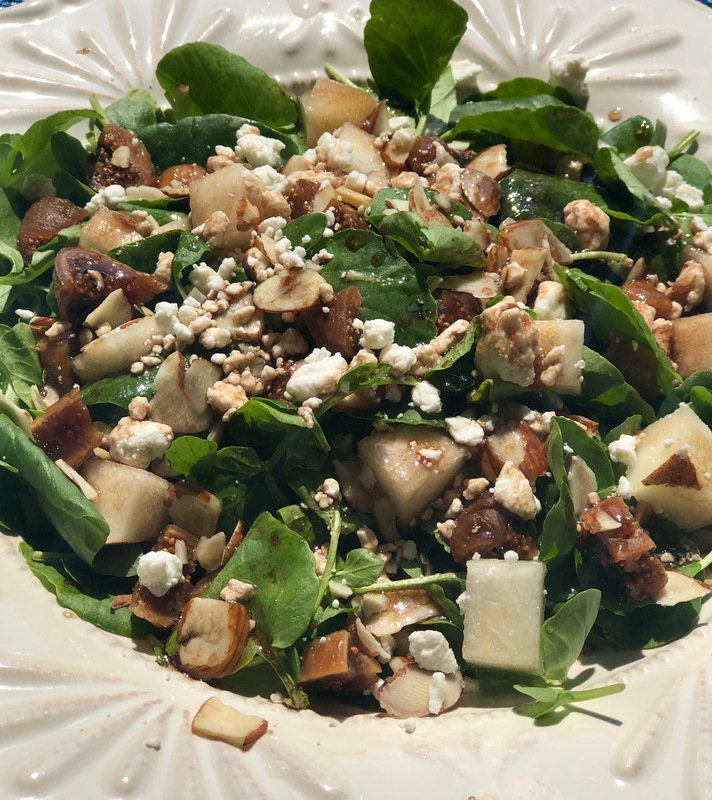 I used Bartlett pears because they are super sweet and blend well with the sweet taste of balsamic vinegar and figs and complex flavors in watercress. You don’t need to sacrifice health, taste and convenience. Watercress is the next hot green leafy veggie. 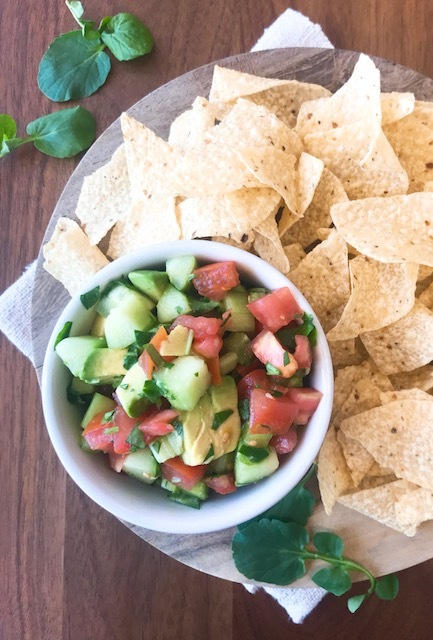 Try it in this mouthwatering salad today! Morris MC, Tangney CC, Wang Y, Sacks FM, Bennett DA, Aggarwal NT. MIND diet associated with reduced incidence of Alzheimer’s disease. In a small bowl, whisk together olive oil and balsamic vinegar. Set aside. In a large bowl combine rest of the ingredients. Drizzle with dressing and serve immediately.